Companies have long engaged in head-to-head competition in search of sustained, profitable growth. They have fought for competitive advantage, battled over market share, and struggled for differentiation. Yet in today’s overcrowded industries, competing head-on results in nothing but a bloody “red ocean” of rivals fighting over a shrinking profit pool. In a book that challenges everything you thought you knew about the requirements for strategic success, W. Chan Kim and Renée Mauborgne contend that while most companies compete within such red oceans, this strategy is increasingly unlikely to create profitable growth in the future. Based on a study of 150 strategic moves spanning more than a hundred years and thirty industries, Kim and Mauborgne argue that tomorrow’s leading companies will succeed not by battling competitors, but by creating “blue oceans” of uncontested market space ripe for growth. Such strategic moves --termed “value innovation” --create powerful leaps in value for both the firm and its buyers, rendering rivals obsolete and unleashing new demand. 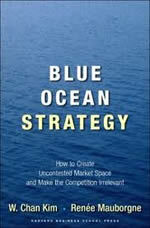 Blue Ocean Strategy provides a systematic approach to making the competition irrelevant. In this frame-changing book, Kim and Mauborgne present a proven analytical framework and the tools for successfully creating and capturing blue oceans. Examining a wide range of strategic moves across a host of industries, Blue Ocean Strategy highlights the six principles that every company can use to successfully formulate and execute blue ocean strategies. The six principles show how to reconstruct market boundaries, focus on the big picture, reach beyond existing demand, get the strategic sequence right, overcome organizational hurdles, and build execution into strategy. Upending traditional thinking about strategy, Blue Ocean Strategy charts a bold new path to winning the future. Get the strategic sequence right. Conclusion : the sustainability and renewal of blue ocean strategy.